“Gangs All Here” – The Turtles are in turmoil, arguing amongst themselves regarding where they should reside. Raph wants to take up residence in an abandoned church, Leo wants to return to the sewers, Don wants to go to Massachusetts and Mike wants to stay in April’s building to protect their friends – a plan that seems all the more necessary when a gang attacks a man living next door. 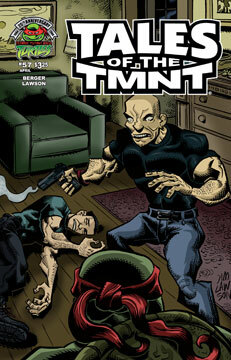 The TMNT intervene and find themselves battling enemies new and old… very old!